Over the last few days, we have been looking at the geology and volcanic history of Pillan. Pillan experienced a major eruption in 1997 that was seen by the Galileo spacecraft as it was wrapping up its primary mission in Jupiter orbit. In Part one on Monday, we looked at the geology of the region around Pillan Patera and Voyager and Galileo observations of the volcano prior to the 1997 eruption. In Part two yesterday, we focused our attention on Galileo's observations of the eruption itself and how the 10s of cubic kilometers of lava erupted not from the volcanic depression named Pillan Patera, but from a fissure north of the patera. The source fissure was more clearly visible in pre-eruption images, such as those taken in November 1996, as it was largely covered over in images after the eruption. The fissure may be an extension of a fault that bisects Pillan Mons, further indicating that Io's magma often exploit pre-existing faults to reach the surface. We left off yesterday in March 1998, when Galileo acquired its first detailed view of the eruption site since November 1996. The images showed that lava from the 1997 eruption covered more than 5,600 square kilometers (2,200 square miles) of Io's surface, including the floor of Pillan Patera, where lava poured over the wall of Pillan and down onto the floor of the patera. For a comparison, lava from this eruption covered an area the size of the U.S. state of Connecticut (or the nation of Brunei). Galileo observed the Pillan region using the Near Infrared Spectrometer (NIMS) in May 1998, July 1998, and May 1999. The NIMS observations during this period showed a steady decrease in the power output from the volcano, indicative of cooling lava. By May 1999, the power output seen by NIMS at Pillan was an order of magnitude less than during the peak of the eruption in June 1997 (from Davies et al. 2001). 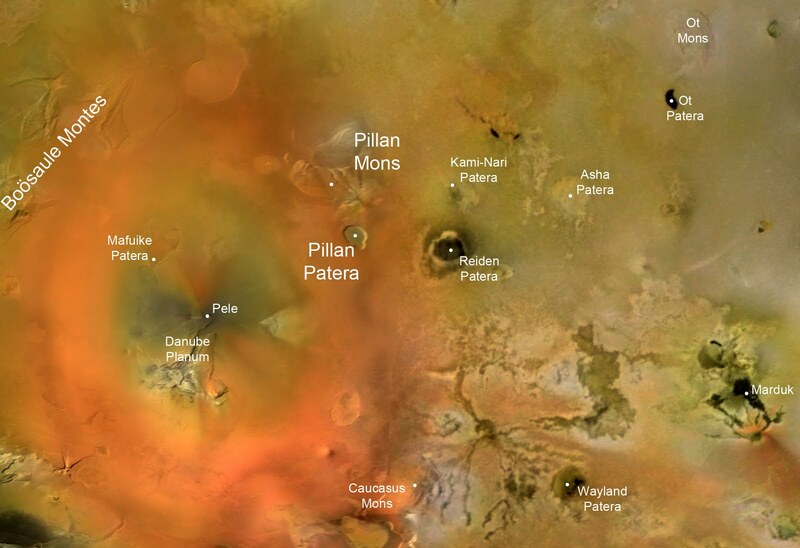 SSI images of Io's trailing hemisphere in July 1999, shown at left, showed slight changes in the Pillan pyroclastic deposit surrounding the eruption site. Most of the western half of the deposit had been subsequently covered over by reddish sulfur from Pele and the northern half was covered up by bright sulfur dioxide frost, likely from sapping from Pillan Mons. Finally, portions of the eastern half of the deposit were covered up by dark pyroclasic and bright plume deposits from the nearby Kami-Nari volcano. These changes further showed that Pillan was much quieter in terms of activity than it was during the eruption in 1997. 13-frame mosaic covering the Pillan flow field. Full-resolution version also available. 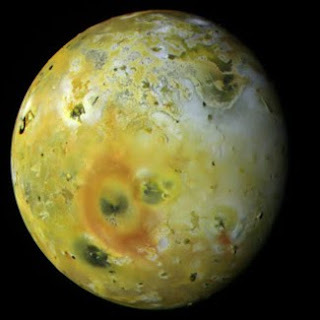 On October 11, 1999, Galileo performed its first close flyby of Io since the spacecraft entered orbit around Jupiter in December 1995. 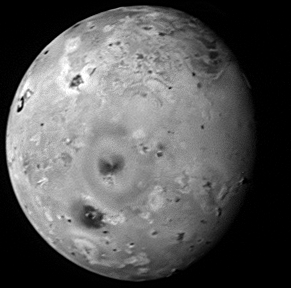 The close range of the encounter over Io's trailing hemisphere provided an opportunity for the onboard camera to observe the Pillan lava flow at high resolution (9-18 meters or 30-60 feet per pixel). Unfortunately, due to a camera anomaly, 12 of the 13 images were scrambled, requiring extensive processing to bring out useful information. Despite this processing, most of the images were heavily degraded and included a dark stripe down the center of each frame. The partial full-frame mode image, shown at the lower left of the above mosaic, did not suffer from this anomaly. A rough lava flow emplaced a broad sheet (rather than a channelized flow) was revealed in this mosaic, with pits and lava channels across parts of the flow. Using the length of the shadow along the margin of the flow on the left and right sides of the mosaic, the Pillan lava flow was found to have an average thickness of 8-11 meters (26-36 feet). The rough texture of the lava surface may have resulted from a number of factors, including the interaction between the hot lava and the cold, volatile-rich surface it flowed over, turbulent flow, and the disconnect between the high effusion rate (the volume of lava flow for each meter of the vent fissure) and the speed of the flow front. In the first case, gas created by the heating of sulfur dioxide frost by encroaching lava flows would burst through the cooled crust of the lava flow. This action would disrupt the cooled lava crust and may form rootless vents that provide gas for the plume seen over Pillan in 1997. One such put can be seen in the left side of the mosaic. Turbulent flow within the lava flow would cause any cooled crust that may have formed to break up into blocks or rafts. These rafts can also disrupt the cooled crust as it is moved downstream by the still molten lava beneath. This can cause gouges to form in the flow field, like the one seen below and to the left of the dark pit on the left side of the mosaic. In the final case, the high lava effusion rate would lead to a crumpling of the lava crust as the flow front advanced at a speed of "only" 0.3 to 1 kilometer per day, the result of the leading edge giving up heat to mobilize surface frost. This would create the rubbly surface texture seen in the October 1999 images. 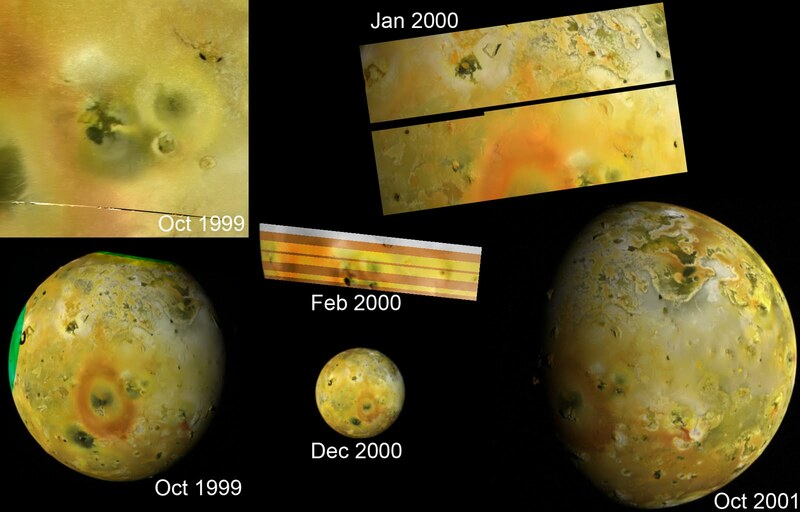 Galileo observed Pillan from a greater distance on several occasions following the October 1999 flyby of Io. 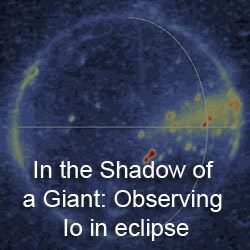 A montage of the SSI observations of Pillan is shown at right. The observations document the gradual fading of Pillan pyroclastic deposits as they are covered by deposits from nearby volcanoes like Pele, Kami-Nari, and Reiden. By December 2000, the deposit was all but invisible except for a faint deposit southeast of Pillan. Interestingly, the multi-spectral color imaging from January 3, 2000 provided the highest resolution color information of Pillan, the source vent of the 1997 eruption, and lava flows. They showed that the flows were greenish in color, perhaps due to the interaction between the still warm lava and sulfur from Pele's plume, producing a layer of impure sulfur mixed with iron (FeS). The observation also showed that the fissure source vent of the 1997 eruption was red in color, similar to other fissures on Io's surface, such as East Girru or the fissure (or lava tube) within the southern end of Lei Kung Fluctus. The Photo-Polarimeter Radiometer (PPR) continued to measure the decreasing power output from Pillan as the Galileo wound down in late 2001 before it plunged into Jupiter in September 2003. After the end of the Galileo mission, Pillan would be observed from an even greater distance, either from Earth using telescopes such as Keck or the European Southern Observatory or from the New Horizons spacecraft during its encounter in late February 2007. Thermal hotspots were detected at Pillan throughout the 2000s by Keck, suggesting that a low level of volcanic activity continued after the 1997 eruption. Pillan was last detected as a hotspot during a brief observation by Marchis et al. on June 28, 2010. This last observation suggests that Pillan may currently be coming down from a recent eruption. All was quiet at Pillan during the New Horizons encounter in 2007. The fading of the pyroclastic deposit from 1997 was complete by that point, and the floor of Pillan was once again covered in a thin coat of sulfur frost from the Pele plume, making it show up bright in the LORRI camera images. Only the still dark lava flow north of Pillan Patera suggested that anything had happened at Pillan between 1979 and 2007. No thermal hotspot was observed at Pillan by either LORRI during two eclipses of Io by Jupiter or by the LEISA near-infrared spectrometer. In 1979, Pillan was a quiet volcano that was not even worthy of a name. 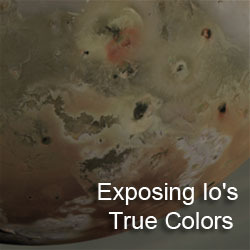 But in 1997, a major eruption there allowed scientists to track the changes it created on Io's surface at a close range. The eruption became the archetype for fissure-fed eruptions on Io, producing large-scale surface changes, areas of incandescent lava, and lava fountains at the source vent. 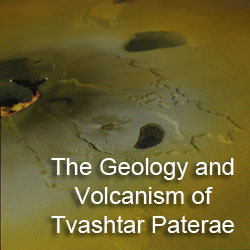 Similar, even more powerful eruptions would later be seen at Surt and Tvashtar. Potentially, the East Girru eruption seen by New Horizons may be most similar to what happened at Pillan in 1997, though the short duration of the encounter prevented follow-up observations of East Girru. 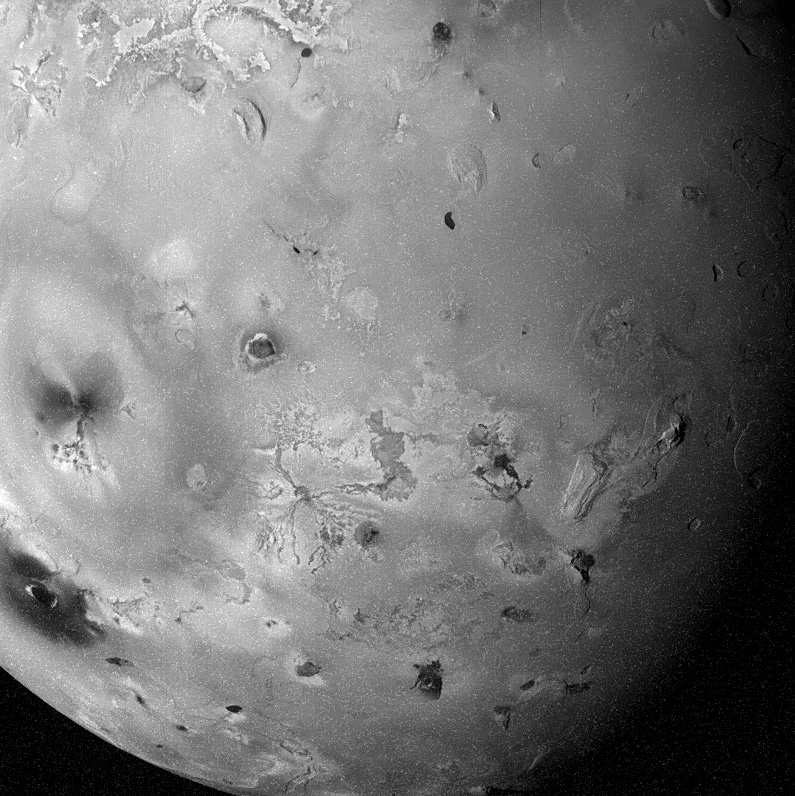 Thanks for reading this week's premiere of my "Io Volcano of the Week" series! If you haven't already, I encourage you to read Parts One and Two of my profile of Pillan. Next week I will be profiling a volcano that should only require one post to discuss: Zal Patera.